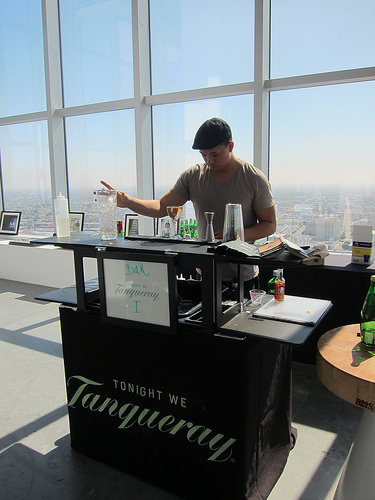 A few weeks ago, Tanqueray set up shop in Downtown Los Angeles inviting the bartending community to several classes taught by “Professor” Angus Winchester. Angus is the Global Ambassador for Tanqueray. He travels so much and doesn’t call any one place home anymore. It was very fun though to leaf through his cocktail books and look at his memorabilia including some fascinating jiggers and other bar tools. 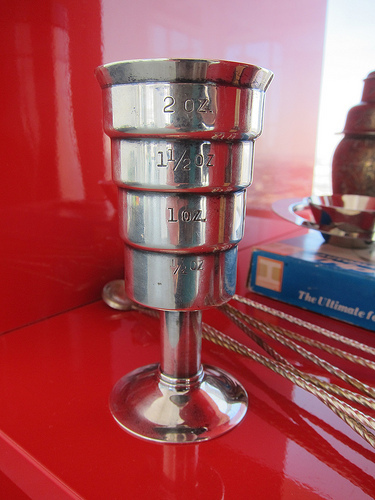 I particularly liked this martini scale. I didn’t get to the earlier class but I did catch some finishing up their cocktails as every class had a drinks making component. 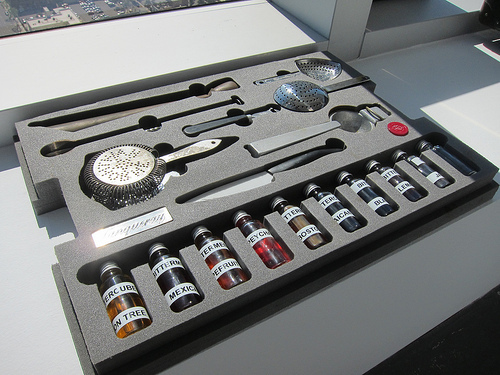 When I saw this bar kit, I thought this would be the sort of thing bartenders would carry if they had an espionage bent. Instead of instruments of torture, you got instruments of (drinking) pleasure. Check out more memorabilia pictures here in my flickr set. 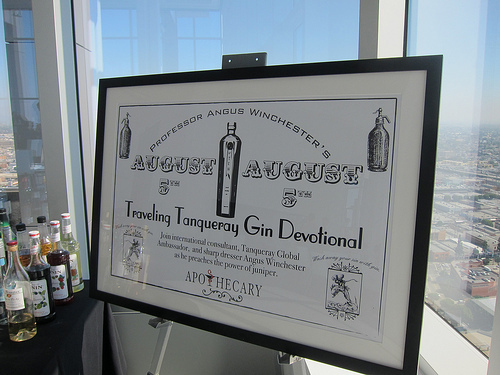 Angus began the University of Bartending with an introduction to gin. 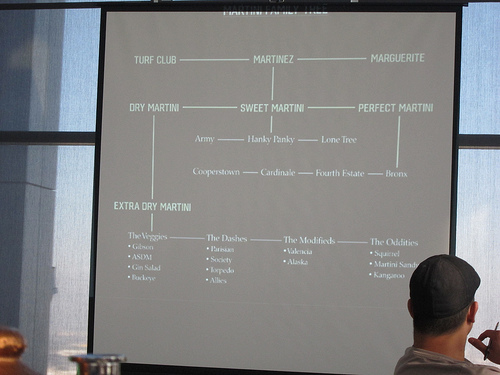 Briefly, it’s a neutral spirit with botanical and juniper is the dominate botanical. But these days there are many gins on the market where juniper isn’t the dominating botanical. We’ll talk about these new world styles later. Then we went into a bit of history of gin. There were about 8 good gins about 80 years ago. Now there seems to be new gins on the market every day. Gin is in (again). It seemed it wasn’t as popular after the 50s when “kids” didn’t want to emulate their parents. Then came vodka, the ready made drink mixes, the 70s-80s were some dark times for gin. We also talked about some trends including Japanese bartending. But Angus is really jazzed about Australian bartending. He thinks they’re so far ahead of what we’re seeing these days in America and Europe. Then we had a good shudder over cocktails made with chicken blood and White Russians with human breast milk. Surprisingly, he’s been offered this several times in several places. There are a couple of ways to distill gin. You either add the botanicals in the still the first time around or you do add it to a neutral spirit and let it steep. Tanqueray is made the first way. And now there is another way. Another option is to suspend a basket of botanicals in the still and as the liquid heats up and then turns to steam, it picks up the flavor and when it eventually reformulates to liquid, it has picked up some of the flavor. Obviously a juniper forward person would find this offensive and even the adding botanicals to an already distilled spirit causes some grumbling. It draws to mind flavored vodka. We covered a few other topics including how a bartender should ask a guest how they’d like their martini (what gin, wet or dry, shaken or stirred, olive or twist). For the record, I’m open to the gin (though I like juniper forward), wet, stirred and it depends if on the time — I might have an olive during the day and a twist at night. I’d be glad if a bartender asked me those questions. To continue with the idea this was an university, we talked a bit about psychology and in particular, body language. Angus mentioned the Sullivan nod, named after Jim Sullivan. If a bartender approached you and reeled off a list of cocktails, you might order the drink he told you about and nodded about. In fact, something like 65% guests will. I tend to employ the smile and nod while gesturing with my camera if I could take a photo. Almost always will someone nod, smile and agree to a photo. There were a few more esoteric subjects best for the advance student. For now, it’s time for a meal break….and a cocktail. This entry was posted in alcohol education, alcohol tasting, bar stories, bartenders, cocktails, history, la, la cocktails, los angeles, spirits, the minty and tagged alcohol education, angus winchester, bartender education, bartenders, bartending, education, gin, hot bartenders, la cocktails, los angeles, tanqueray, tanqueray gin, the minty, university of bartending. Bookmark the permalink.